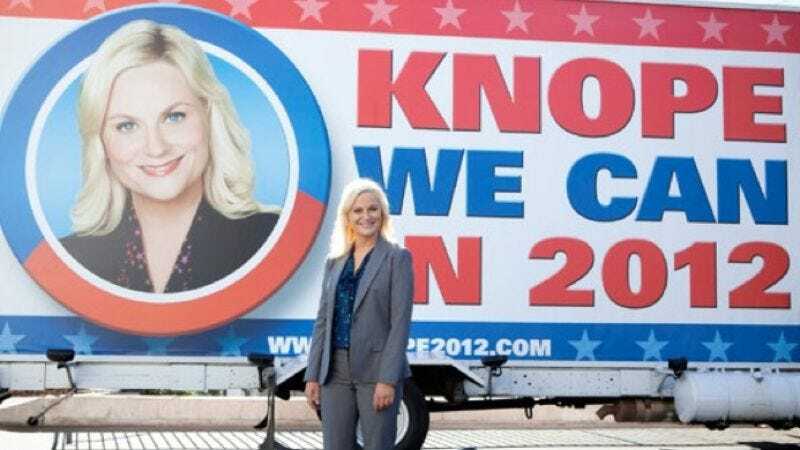 Confirming, thankfully, that this season of Parks And Recreation will sidestep the cliché of ending on a cliffhanger, Deadline reports that the show has recently wrapped a finale that will answer definitively whether Amy Poehler’s Leslie Knope wins the city council election that feels like it’s been dragging on exactly as long as a real election. But wisely, only those closely involved with the production knows what happens for sure, because they shot two versions of the ending—one in which Leslie makes a concession speech, another where she proudly triumphs, either of which would be fine so long as it’s over and Leslie can get back to doing more varied things. Executive producer Michael Schur made the revelation at a recent PaleyFest appearance, saying that the strategy was partly to avoid leaks and spoilers, but also partly “in case we changed our minds”—suggesting that he’s still open to pressures from the Internet, so perhaps there’s still a chance to force him to cater to your whims if you start doing that right now.